If you create Wood Framing Plans in 3D, then this app will definitely save you a huge amount of time. Create a Wood Framing 3D model using a single line to represent the framing elements of the model. Use a single line to represent the wood stud centerlines and the wood stud is then inserted using the center insertion point. For Wood Floor Joists use the top of wall line and the wood joists are inserted using the bottom insertion point. Rafters can be inserted using the top or bottom insertion points. Select your Wood Framing type, click OK then select the lines to be framed. Each Wood shape is extruded along the line selected for a fast framing solution. Choose from a variety of preset LVL's, 2x's, 4x's, and 8x's or just enter the width and height of the beam or column you require not listed in the pre-sets. Choose one of three Wood Beams Options including Single, Double, or Triple beams or columns. 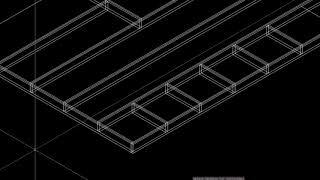 Insertion Point selections for each beam or column, for all selected framing lines, can represent the Center, Top, or Bottom of the framing beam or column.